Bob Dylan surprised a lot of people when he announced the release of his first Christmas album several months ago. 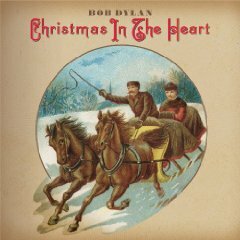 “Christmas in the Heart” surprises in a different way, however, by playing it straight and offering no surprises at all. Adorned with a cover that looks like a Norman Rockwell collectible dinner plate come to life, “Christmas in the Heart” features 15 well-worn holiday favorites with arrangements and production straight out of the 1940s and ‘50s. Of course, Dylan has long been a purveyor of traditional song and the folk tradition. As the oral history components of American society diminish, holiday and children’s music are the few remaining songs passed from generation to generation. Christmas music stands directly at the crossroads of these passions. A third consideration is that Dylan delights in doing the unexpected and challenging expectations. The man who returned to the Newport Folk Festival nearly 10 years ago in a wig (and dons a similar headpiece in the video for a “Christmas in the Heart” song), appeared in a Victoria’s Secret commercial and wrote a song with Michael Bolton, clearly enjoys toying with his dedicated following and legend. Unfortunately, this understanding doesn’t make “Christmas in the Heart” an enjoyable listen. Producing the album under the pseudonym Jack Frost, Dylan drapes the album in arpeggio guitars that recall Les Paul’s singles with Bing Crosby, lilting backing voices in the style of the Andrews Sisters and a nostalgic gauze that would be at home on a Perry Como platter. By smoothing every surface, Dylan leaves no room for any rough edges, which, frankly, is all his voice has to offer these days. The single “Must Be Santa” hints at what “Heart” could have been. Originally a 1961 sing-along with Columbia Records honcho Mitch Miller, Dylan more than doubles the tempo and thanks to the frenetic accordion playing of Los Lobos’ David Hildago – who also bolstered Dylan’s “Together Through Life,” released just six months prior – turns the song into a mariachi rave. Another lesser-known track, “Christmas Blues” was also a good choice. More songs like this and fewer Latin hymns could have made “Christmas in the Heart” a holiday staple. With all album proceeds going to charity, Dylan’s intentions are noble and his reasons sound, but the flawed execution prove the record’s undoing. It’s too bad “Must Be Santa” wasn’t released as a stand-alone single, with any of the remaining 14 songs on its b-side, or as the centerpiece of an EP. As it is, “Christmas in the Heart” is best purchased as a Black Friday bargain. No it’s not to be bought only on a sale day as you put it, do something worthwhile and don’t be such a cheapskate and give something to others less fortunate than your self. Thanks for reading, Ray. You’re absolutely right. Because all the proceeds go to feeding the hungry, this is definitely a worthwhile purchase. What happens to the album once it goes past the register, however, is a different matter. On behalf of Bob Dylan, many thanks for plugging “Christmas In The Heart”, the charity album benefiting Feeding America, Crisis and the World Food Programme … .. and, if your readers want good quality, non-pirated, previews, then “Must Be Santa” is available for fans and bloggers to post / host / share etc from http://www.myspace.com/bobdylan and a special widget is also available from http://www.bobdylan.com/#/christmas-in-the-heart-donate... .. for further details of the album, on-line promotions, videos and 2009 / 2010 shows, check-out http://www.bobdylan.com and http://www.youtube.com/bobdylantv... .. and keep an eye on these official sources for details of further news and preview material. This is to be ENJOYED, regardless of you religion or if you have none, and most people who buy or admire Mr Dylan will know that is why he did it. If it brings any listener one iota of love, peace, calm, joy or humour then it will have done its job. That said, The Daily Record smiles upon any piece of music that brings the listener joy. Whatever makes you happy is fine by us.